If you come to my house and do some of the things I accidentally on purpose neglect… like wipe out the shelves in my fridge after spilling a half cup of cornstarch on them (it happens) and dust things like every single crevice in the house and throw away old magazines with the promise of losing 8 pounds in 3 days and maybe… maybe even clean the hair out from my shower drain (? )… I will totally love you forever. And also make you breakfast. Because I know… that whole drain thing is skeevy. Some days I’ll make you pancakes and others I may make you muffins. And on the occasion that we drank four too many mojitos during the best sleepover ever the night before, I may just serve you a piece of stale cake (I’m really bad at the whole saran wrap thing) and then go back to bed until dusk. I’m sure you’ll understand. 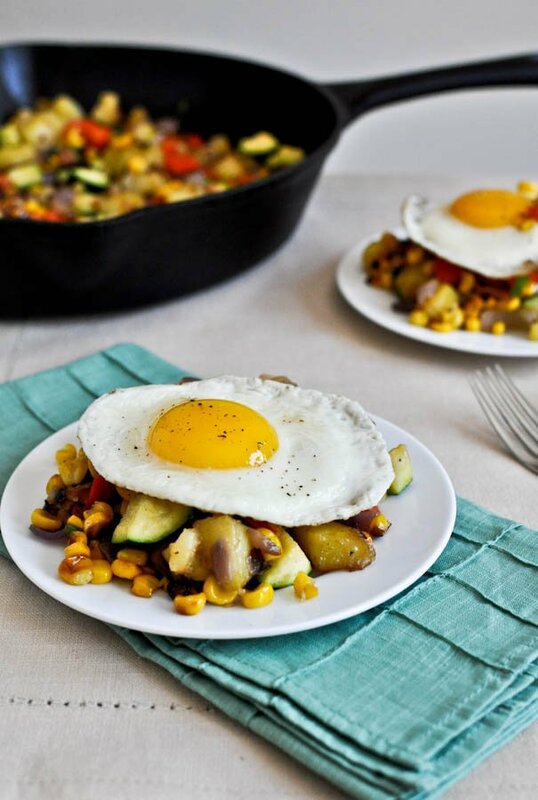 If I have time, which let’s face it: I always have time for food, I’ll even make you this whole slop pile mess of potatoes, bacon, zucchini and leftover grilled corn… cut off the cob from our dinner before the best sleepover ever. It’s reallllllly spectacular. 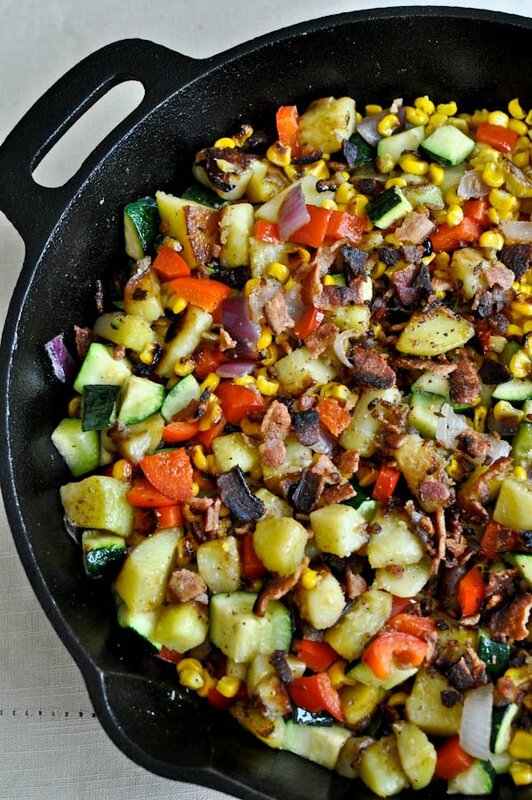 Frying things in cast iron skillets makes them 34 times more delicious. Now you know. Life lesson #145. The thing about breakfast is that… ding ding – it works for dinner too! So if your schedule doesn’t jive with mine? If you can’t make it over first thing in the early morn to scrub my bathroom floor with a toothbrush (yeah seriously)… you can come later and eat this for dinner. See? I always have my thinking cap on. Especially when I grill corn for dinner. I’m always thinking. Always thinking enough to grill three or four extra ears because nothing is as scrumptious on your lunchtime salads, burritos, hashes and pizza than caramely kernels that take less than 30 seconds to heat. Mmmm mmm. I promise this hash (not that hash) will make up for the cobwebs you’ll find in the corners and the mildew you’ll find on just about, well… everything. It’s chock full of crispy potatoes and soft, sweet and juicy peppers and onions. Some zucchini is in there too because… it’s summer! Have you heard? And obviously the caramely kernels are the best part because who doesn’t like vegetables that taste like candy? I’ll top it with an egg because you deserve it. Mimosa on the side too. Heat a large skillet over medium heat. Once hot, add chopped bacon and cook until crispy and fat is rendered – about 4-5 minutes. Remove bacon with a slotted spoon and drain on a paper towel. Add potatoes with a sprinkle of salt and pepper to the bacon fat and cook for 8-10 minutes, stirring and tossing every few minutes. 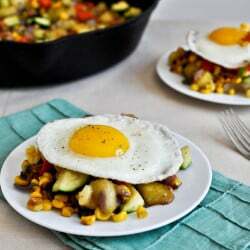 While potatoes are cooking, heat another skillet on medium high and cook your eggs as desired, then set aside over low heat. Add peppers and onions (and another little sprinkle of salt and pepper) to potatoes and cook for another 5 minutes, stirring. At this time you may need to add the additional teaspoon of olive oil depending on how much bacon fat is left. After 5 minutes, add in the zucchini and garlic and cook for 5 minutes more, stirring. Turn off heat, then stir in grilled corn and bacon. Top with sliced green onions. Serve with an egg on top. Note: I haven’t tried it yet but I’m assuming you could possibly pan-roast your corn before frying the bacon. Also, you can use any kind of corn, though the caramelized kernels are the best! Now can we talk about my shoe closet? I’ll make you a breakfast dessert to tackle that one. You just won over my heart. Seriously. 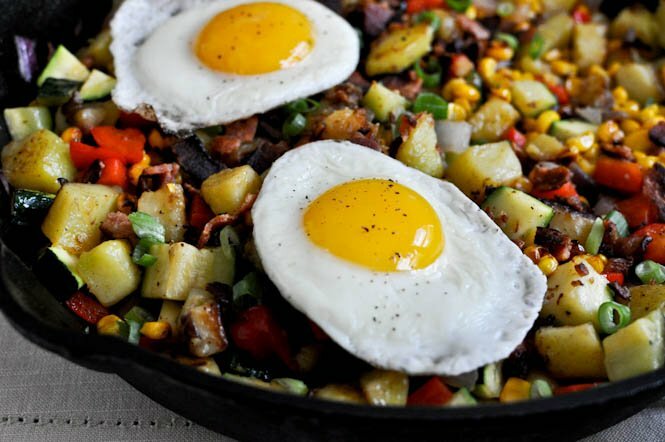 Veggies, bacon, and sunny-side up eggs? Three of my all-time favorite foods in one dish. OK…I’m obsessed with your site. I live in California and made this for my breakfast. OMG it is so delicious! That has to be one of the quickest turn arounds right? How do you get the egg fried so perfectly? Mine are always so bubbly and odd-shaped. I use an electric griddle on the lowest setting! But I just did that for photography purposes – I fry an egg just like everyone else when I’m making things that aren’t going on the blog. I see! Thanks for responding. I’ve been following your blog for a while now and I really enjoy it. The photography is great and the recipes are spectacular. I’ve tried many of them! Writing a cookbook any time soon? Can you be my teacher on all things cooking and photography? Your pictures and food are absolutely wonderful! I promise I’ll eat all the food! I wish we were friends. I would totally drink 4 too many mojitos at a sleepover. I’m really good at cleaning. I may even wake up early to sneak out and go get some overpriced mocha coconut frappuccinos. Um… given that last line, we basically ARE friends. This is making me want to cheat on my pregnancy rules and have a runny egg. I love this kind of breakfast! Hey Jess….I will clean for that breakfast hash!!!!!!!!! 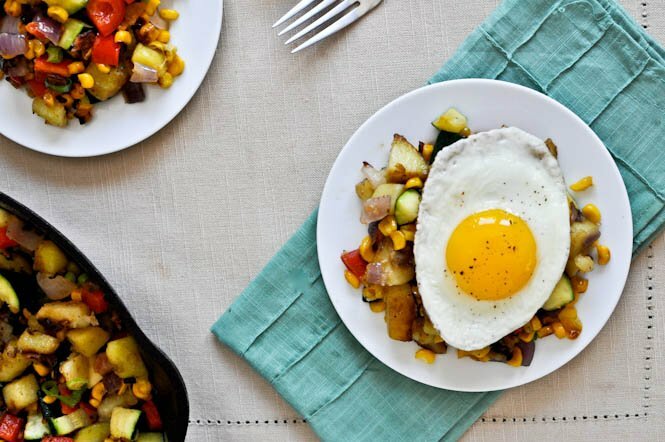 My fiance loves “hash” type breakfasts – I love the focus on the veggies in this one! Looks delicious! Those are the most perfect eggs I’ve ever seen. PS. Seeing that bottle of Sunflowers is a total blast from the past – I was obsessed with it as well! DEEELISH jessica!! another hit! Zuchinnis are so good this summer!!! I would totally work for food! Yum. Yum!!! This looks awesome. I’m pretty good at cleaning the hair out of the drain. My hubby requires it. It grosses him out, plus I’ve clogged the drain enough to require three doses of liquid-plumber down said drain in only 9 months of living here….soooo yeah. I’m used to it :) Gross! I love the vibrant colors!! Beautiful hash! We will be having this for breakfast this weekend!!! I can’t wait! That looks lovely! I love how colorful and looks flavorful it is. Yum! I just can’t wait to try it. I want a cleaning/eating sleepover. :-( And I want this hash. Consider your house wiped down, polished, and damn near sparkling…you will be able to see your reflection in that cast iron skillet by the time I’m done with the place if this is what’s on the table! I thought there was nothing better than SUPER sweet grilled corn and then you had to go and put a drippy egg on it…I. am. in. LOVE!! Yum! I made this today since I actually woke up at a grown-up time and it is so good! I went to the farmers market on Saturday and had bought everything in the recipe except red peppers (well, and eggs & bacon, but I always have that in the fridge). I will definitely make this again! 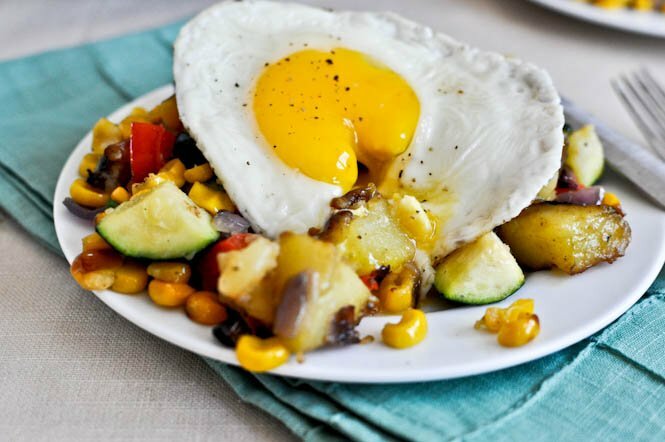 somehow a sunny side up egg makes everything delicious! 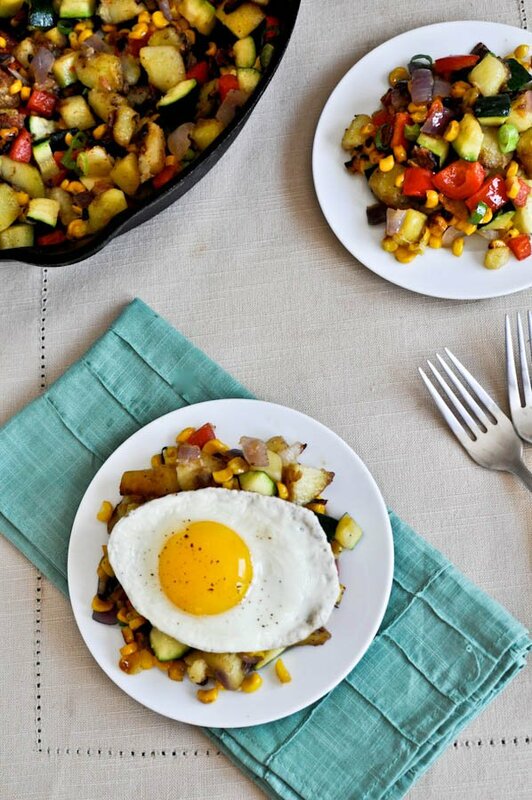 love the vibrant colored veggies and perfect eggs! How long could you store everything together except the eggs? I’m looking for a breakfast, that’s not coated in sugar (wahh!) that I make a large batch and then reheat for a quick morning breakfast. I think you could make it on Sunday and it enjoy it for the rest of the week! Make the eggs each day. just made this, added asparagus (because i had them around) and served it on top of fresh spinach and thyme. WOW. This is an amazing recipe THANKS!